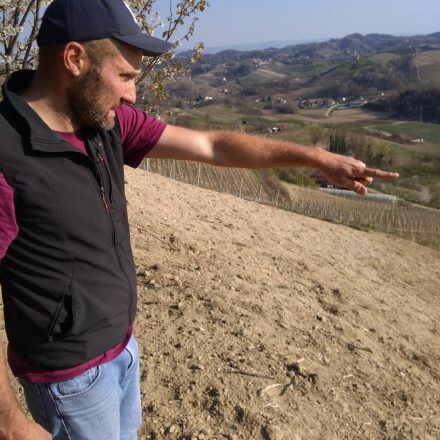 A little gem of a Roero producer, young Alberto Oggero owns 4.20ha in the comune of Santo Stefano Roero, centred round three MGA, single vineyards in the ‘Valle dei Lunghi’: Le Coste, Anime & SS Trinità. Production is focused on old vine Roero Nebbiolo & Roero Arneis. Alberto’s grandfathers, Sandro & Tommaso, tended in total 2ha of Nebbiolo, while his parents chose to work in Ferrero & administration. With Sandro’s passing in 1999, Alberto, fresh out of Alba’s wine school Umberto 1, chose to dedicate himself to the vine, thanks in grande parte to a grandfather (Sandro d’Pindeta) who often took his nepote on tours of the vineyards, on the back of a tractor. But it wasn’t until 2009, after ten years of experimenting, that Alberto bottled his first wine: 500 bottles of Roero Arneis! His first Roero Nebbiolo wasn’t released until vintage 2011. In his small, but beautifully vaulted cantina in the village of Santo Stefano Roero, Alberto uses a combination of cement, stainless-steel, tonneaux & botte grande, & wild yeast. The Roero Arneis comes from the clay rich vineyard of SS Trinità, towards Canale, & from nearby is also the source of his Vino Rosso ‘Sandro d’Pindeta’, on sandier soils. The fruit for the Roero DOCG is harvested from the high, & steep silty sandy soils of Le Coste, while the Roero Riserva is from the 80yo, steep, calc sandy Anime vineyard above his cantina. Alberto captures the soft, pure, weightless expression of Nebbiolo from Santo Stefano Roero. 2017 Roero Arneis – 13%, bottled Aug’18, circa 8k bottles, from the cooler, clay rich soils of the SS Trinità vineyard that lies at the end of the Valle Lunghe, closest to the border with Canale. Using a combination of stainless-steel & botte grande, in 2017 he chose a 80%/20% blend. Compared to other producers of Roero Arneis, Alberto actively encourages the wine to undergo malolactic fermentation/transformation, to complete the wine. A bright lemon yellow, the nose is refined, relaxed yet purposeful, with distinct, beautifully defined citrus aromas, & a hint of flint. The palate is similarly elegant, tightly woven, restrained, detailed, with agrumato, lemony aromas & a sapid structure, & complexity that recalls more Chardonnay (Chablis?) wine than your typical Roero Arneis. 2017 Vino Rosso ‘Sandro d’Pindeta’ – 14%, 100% Nebbiolo, circa 6k bottles, first vintage was in 2011, named after Alberto’s grandfather, from Santo Stefano Roero soils with circa 66% sand, & the rest calc clay, fermented in cement, on the skins for only 5 days to capture the rose & peachy essence of Santo Stefano Nebbiolo! Very pretty, carino, translucent pinky red, soffice, spremuta purity & delightfulness! Helped by a sunny, engaging vintage. Da bere! 2016 Roero DOCG – 14.5%, 100% Nebbiolo, circa 20 days on the skins, both submerged & floating cap, aged in 500L tonneaux, not fined or filtered, only circa 2k bottles available, sealed with DIAM10, from Santo Stefano Roero’s high, steep Le Coste vineyard that looks across at Vezza d’Alba to the south, on white sandy/silty + clay. Compared to the warm strawberry flesh of the 2015, the 2016 has more vim & energy! Bright indeed, lower pH, distinct licorice, spezia/spicy, balsam oil dimension to the fine, soft, but mentholated fruit. Exciting. 2015 Roero Riserva DOCG – 14.5%, 100% Nebbiolo, from the impossibly steep, natural amphitheatre that is the Anime vineyard high above Alberto’s house & cantina, planted in the 1940s on a white, sandy clay soil, facing SW, hence naturally low yields of 23hl/ha…vinified on skins for 25 days in cement, followed by further ageing in small, reconditioned cement tanks. Compared to the 2015 Roero, brighter, with a more floral, less fruit, rosa canina/hip lifted perfume; the palate is more fruttato, with notable (2015) strawberry & talc notes, with a beautiful sapid tail.